Spoiler alert: growing a blog is tough work. You spend hours writing posts, editing images, and promoting your site. And while some days the hard work pays off, other days you wonder if there are more than three people reading. So what can you do? How can you start bringing more traffic to your site? In addition to the standard social media outreach (Facebook, Pinterest, Instagram, Twitter), probably one of the best strategies to increase readership is through collaboration with other bloggers. Yep, collaborating with bloggers provides you with a wonderful opportunity to meet others in your niche, share ideas and strategies, and gain exposure to each other’s audiences. It’s really a win-win situation all around. I know for some people (myself included!) taking that first step to contact another blogger might feel intimidating. And this is especially true if they’re someone you admire. But just remember – by and large the blogging community really is that: a community. So whether you’re struggling with traffic, you hope to reach a wider audience, or you simply want to meet others in your niche, I encourage you to make that gesture and reach out. Don’t worry, I have you covered; this post offers strategies on how to find potential collaborators as well as my favorite collaboration ideas. So read through the list, find what sounds most “doable” for you, and get started! In fact, I’d like to issue you a challenge. This week, I challenge you to reach out to another blogger. Chose a strategy from below, take a deep breath, step out of your comfort zone, and initiate that conversation. Who knows where it might lead? Are you up for the challenge? Great! Let’s do it. 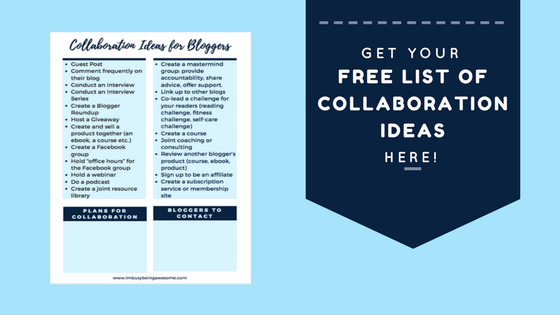 Before you begin contacting other blogs with your collaboration ideas, I recommend first considering these few suggestions below. Doing so will help ensure a successful collaboration for both you and your partner(s). And it will likely enhance your chance for future projects as well! I can’t stress enough the importance of reaching out to those in your niche. Remember, you’re hoping to make connections and gain readership. If you write about fashion, and you’re guest posting on a Whole30 blog, you’re not targeting the right audience. So get to know the active players in your niche, and reach out to them. Who is an Authority in the Field? If your blog already has some traction, and you’ve established a decent following, you might consider contacting a bigger authority in the field. Such collaborations offer you further opportunities to observe, ask questions, and talk strategies with someone who has a lot of experience. If I had a crochet blog, for example, I might reach out to LeftinKnots, which is a fantastic blog that offers free patterns every week, and (not surprisingly) has an engaged audience as well. Similarly, if I wrote about learning languages, I might reach out to Effortless English. Because A.J.’s program was established in 1996, he has both valuable knowledge in the field as well as a loyal following. Before emailing these bloggers directly, however, I first recommend making contact through social media. Think of it this way; do you often walk up to complete strangers in the grocery store and ask them if they want to collaborate? Probably not. The same is true online. So take some time to engage with and get to know these bloggers. If you loved their latest blog post, share it on your Facebook feed. Reply to their tweets. Comment on their Instagram. Chat with them in a Facebook group. In other words, share the love. As I mentioned before, blogging is a community, so get to know one another! As you dive into the process, it’s also important to think about accountability. And this is especially true when you’re engaging in a major collaboration. Can you count on your parter to stick with it? Chances are, if you’ve done your research, highlighted a blogger who posts regularly, engages with her audience, and produces quality work, you have nothing to worry about. But it is important to consider nevertheless. Once you’ve identified potential collaboration partners and you’ve established a relationship, it’s now time to reach out. Look over the suggestions below, choose the one (or more!) that sounds like the best fit for your blog, and get started! Guest posting is probably one of the most popular collaboration ideas for bloggers. And not surprisingly, it’s also quite effective. Essentially, guest posting is the process of writing an article for your partner’s website, and/or having them write one for your’s. This is a fantastic strategy for growing your audience, because you have the opportunity to share your writing with an entirely new audience. And in return, you get great content shared on your site as well. No wonder guest posting is so popular; it benefits everyone! I don’t know about you, but I love reading interview posts. It’s such a fun shift from the standard one-voice blog post, and it offers your readers a bit of variety. Even more fun is creating a themed interview series. Let’s say you’re a fitness blogger. Each month you could interview a different fitness trainer to share their latest routine or workout strategy. 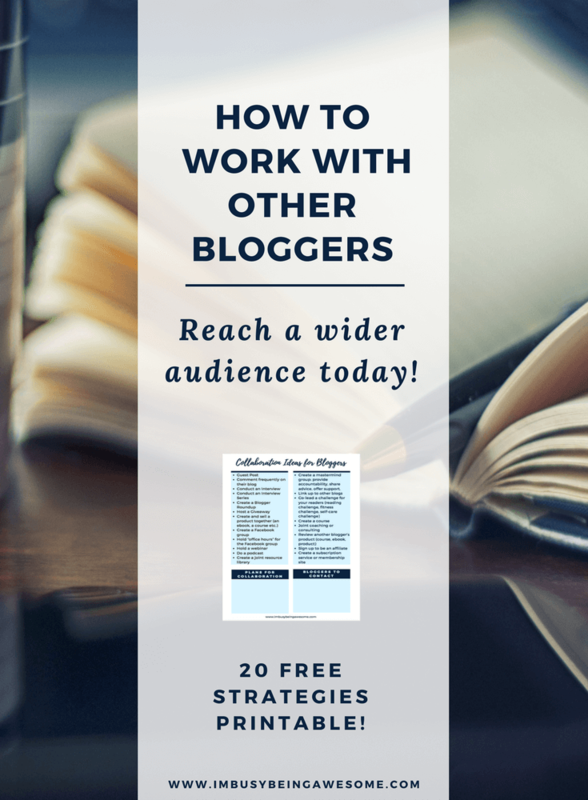 Again, this drives more readers to your blog, offers variety and valuable information to your current readers, and helps you make connections. This is a fun strategy if you’re working on a post that has different approaches or points of view. I was reading a finance blog recently, which featured this type of post. It was quite enlightening, because each author offered their own strategies for effective saving, and by combining their knowledge, they provided a treasure trove of resources for both of their audiences. As a reader, the blog roundup is one of my favorite kinds of posts. Why? Because it provides me with several fantastic resources all in one place. I find this strategy used a lot on food blogs: Christmas cookie roundup, Whole30 Roundup etc. But that doesn’t mean other bloggers can’t use it, too! This strategy is quite popular over the holiday season, but it’s certainly an effective technique all year round. Essentially, each person involved in the giveaway contributes something to a prize pack: this can be a physical product, but it can also be a free class, your latest eBook, etc. Then, using something like Rafflecopter, you collect entries and select a winner after a set period of time. If you’ve participated in a giveaway before, you know that this is a great way to engage with – and reward – your readers. Plus, it’s FUN! Interested in even MORE suggestions? You got it! Click here to get a complete list of 20 collaboration ideas for you to use today! Also – if any of YOU would like to collaborate, please don’t hesitate to contact me. Leave me a message below, or send me an email at paula [at] imbusybeingawesome [dot] com. I’d love to work with you and grow our communities together! So tell me – will you take up the challenge? Will you reach out to a blogger and start the conversation? Which collaboration strategy will you use? Have you ever collaborated with bloggers before? Let me know below! Guest posting rocks Paula. Opened many doors for me while driving traffic to buddy’s sites on auto pilot. Nice win-win scenario for all involved. Tweeted for you. Ah, so helpful! I’ve been trying to think of ways to collaborate, but I’m never sure of what to do. Thanks! I’ve been thinking more and more about collaborating… How would you suggest finding quality candidates? That’s great! There are a few different ways you can approach this. First, I would recommend getting to know others in your niche. When you find some bloggers who write about similar topics, consider whether they’re putting out quality content, how often/consistently they’re posting, whether they’ve done (or regularly do) collaboration projects with other bloggers etc. The other way to join blogging facebook groups. This is a great place to meet other bloggers with similar interests, brainstorm potential ideas, and see if anyone has a similar vision to yours. Good luck! Collaborating is one of my goals for this year! These tips will definitely come in handy, thanks for sharing! Great suggestions. I get super nervous reaching out to other bloggers to colab. I have only been blogging 3 months so I feel like it is not worth anyone’s time to work with me. LOL. I was approached a few times to guest post for people, and that is super exciting. I have done two already and am working on my third. I will keep in mind your other suggestions as well. Doing a giveaway with someone would be pretty fun too! This is such a helpful post! I’ve been considering reaching out to fellow bloggers but can never jump in all the way. Thanks for the encouragement! I couldn’t agree more with this and I really feel that collaborating with other bloggers is so fun! In fact, my next post will be a collaboration where I had a couple of questions for some bloggers to ask their kids! I’m taking their kids feedback and including it all in my post. Fun fun. Ha! I love this! Thank you for compiling such a great list! These are awesome, I think finding the ideal partner(s) is very important too and that looks Ames some time. Yes! It is definitely a big part. Thanks! As a fairly new blogger – I love this breakdown on the collaborating topic. I will definitely use these ideas in the future! Can’t wait! These are some great ideas for me. I’m working on collaborations with other bloggers as we speak. I love these tips! Thank you so much for sharing. I’m a newish blogger and I just submitted my FIRST guest post so I’m hoping she accepts it and I’m really excited about it! Even if she doesn’t, I’m proud of myself for trying 🙂 I want to get a good handle on my blog scheduling wise and then I will be more inclined to guest posting and collaborating more often! 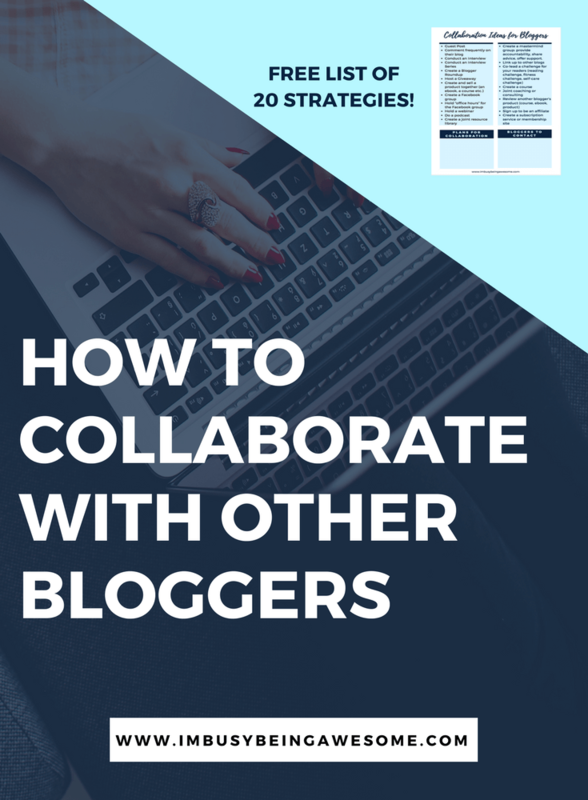 I definitely like the idea of collaborating with other bloggers. You’ve laid out all the “thinking” for me, and I thank you for that! Pinning for near future use!!! Great! I’m so glad to hear it:) And thanks for the pin! These are really detailed strategies. I have used some of them, and really enjoyed and been sharpened by other bloggers. Thanks for the ideas! These are such excellent suggestions! Thank you for walking through the whole process. I’m excited to get started on collaborating! Absolutely! I’m glad you find them helpful. And enjoy the process! Thank You for laying out the basics to build a collaboration and loads of strategies! 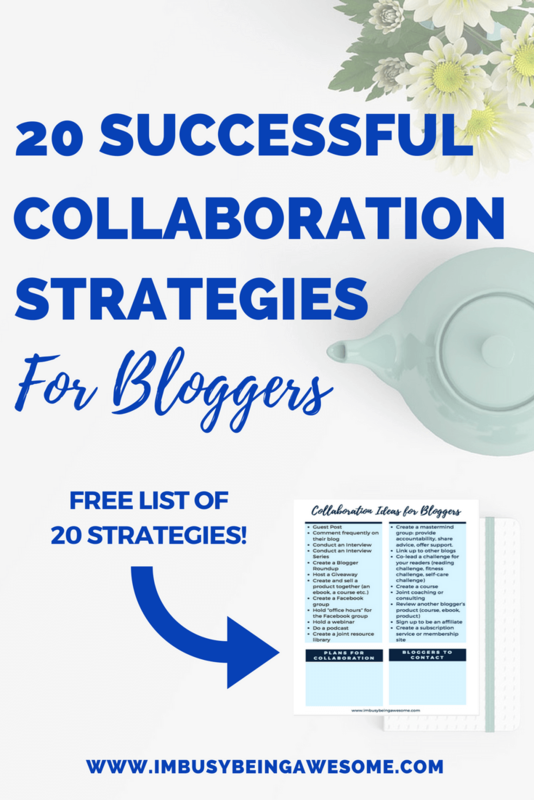 I couldn’t agree more that collaborating with fellow bloggers can make all the difference. Great article! I shared on Pinterest from Mojitos and Munchkins! Thanks, April! And thank you so much for the share <3. I appreciate it! I love this. Very helpful! I’m down to take this challenge and excited to see what comes of it! Yay! I’m so glad 🙂 Keep me posted! I love collaborating with other bloggers. I started a monthly link-up last year with a couple bloggers and I’m doing two more with two other bloggers this year because I love link-ups (they all have a theme so it’s more specific) and I get to “work” with bloggers that I really enjoy. That’s fantastic, Lauren! Link-ups are SUCH a great way to collaborate. And I love that they’re themed. I’ll have to check it out! These are great ideas, and it really is nice to get to know other bloggers better!